Using cycles don't understand how to scale my uv so that it looks right on the model but remains small enough to fit in the uveditor image so i can bake it properly. The texture image is bricks and is about 500x500. Im using an image size of 4096x4096 in the uveditor window. I have to scale the uv up so large to make the bricks look right that it's way to big to fit in the image size i want to bake at. Maybe my texture is too large or maybe cycles isn't the best way to do this? And this is where im stuck I want to bake a texture map here but the uvs are much too large to fit in the image at this size? Do I have to just increase the size of the image or find a smaller texture image? Seems like there would be a way to adjust the texture image size or tiling so that you dont have to scale the uv so big to make it look the way you want but instead decrease the size of the texture. Does something like this exist or is there another answer im over looking? I think what you might be really looking for is using a different set of UVs to bake and a different set to map your source texture. This is a cleaner solution that will allow you more flexibility later on, and will also work nicely if you want to use texture atlases (bake many objects to one large texture). This way you can scale the brick UVs without affecting the UVs used for baking. 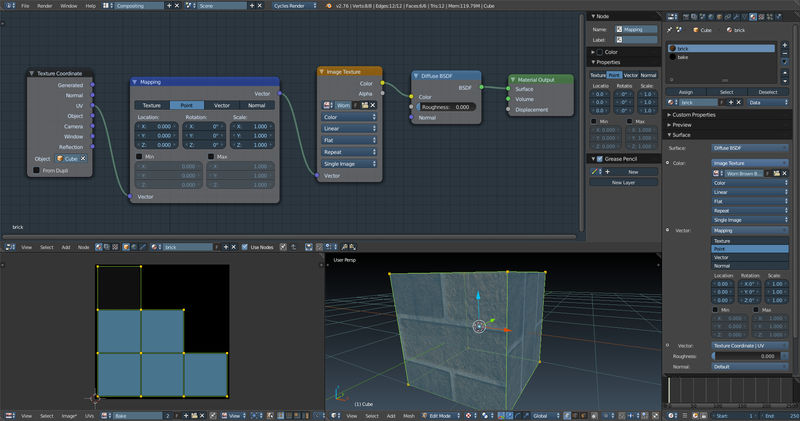 It's in Properties panel > Object Data tab > UV Maps > [+] button. You can have one UV set for the bricks ("brick uvs") and one for baking ("baking uvs"). 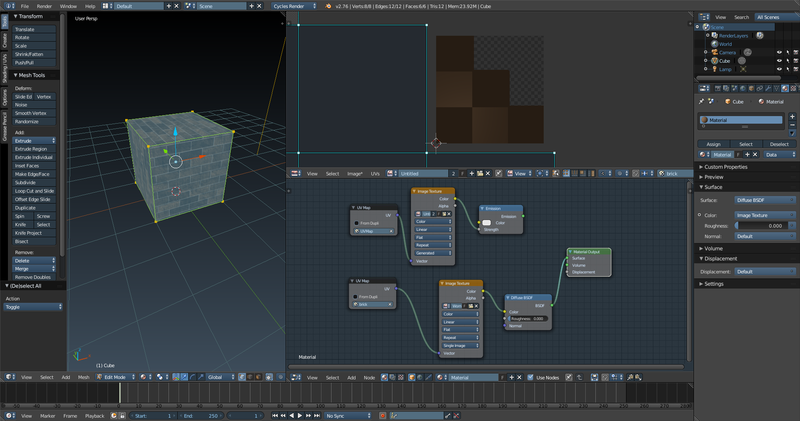 Set the "baking uvs" as default for rendering (camera icon). 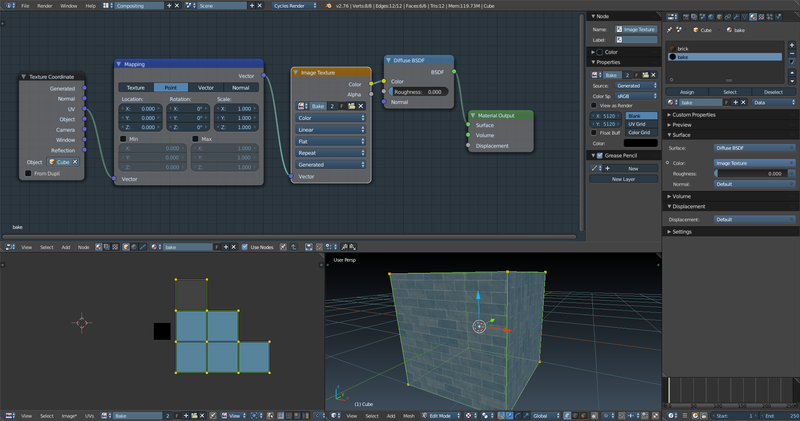 Then in Node Editor, instead of using the Input > Texture Coordinate node's UV output as you are now (this only uses one default UV layout) you can choose Input > UV Map, this lets you choose which UV layout you want to get your UVs from - pick "brick uvs" as input for your texture. If you do this correctly you should be able to freely adjust the UVs for the bricks without affecting the UVs you use for baking. How to scale a UV Image Texture? Unwrapping a cube for multiple textures?